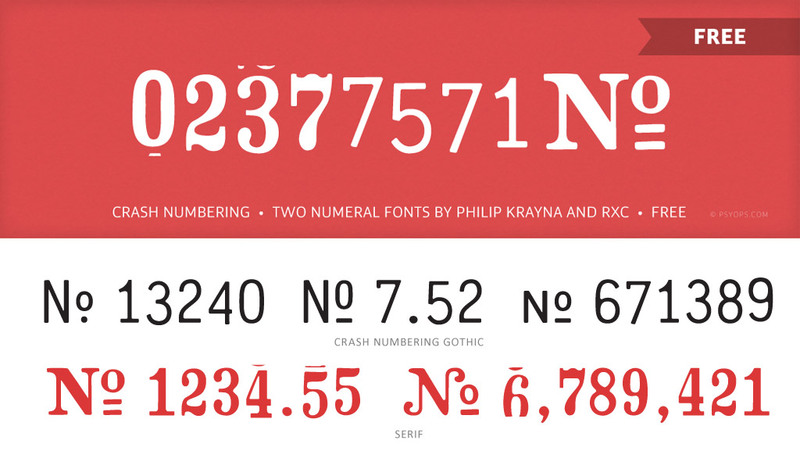 These two numeral fonts are designed by Philip Krayna and RXC. The serializing technique known as crash numbering has been in use since before computers started roaming the earth… some say as far back as the days of phrenology and 5¢ sasparillas. If you’ve ever bought a raffle ticket or been handed a claim check you’ve experienced crash numbering first hand. Our digital simulacrum, which we are proud to present here and now, includes Serif and Gothic styles; three variants of each numeral; and a smattering of numerical symbols. It’s ideal for numbering invoices, gift certificates, undergarments… anything that’ll hold still long enough to run through your inkjet printer. And it’s free.